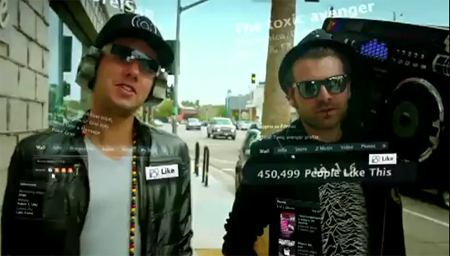 Augmented reality is all about webcam marketing gimmicks and filling the world with geotagged logos, right? Nope, wrong. Instead, we’re learning that the natural mode of expression for AR, is enabling people to *hack time and space*. In 5 minutes, I’ll show you ~20 solid examples of how artists, journalists, historians and citizen activists are using augmented reality to hijack the here and now. If there’s one thing we in the augmented reality community need to do this year, it is to make actually using AR a better experience than looking at screenshots and videos of it. If you ask most AR experts what the biggest challenge is for mobile AR, you’ll likely hear about technology issues. “Mobile AR won’t be taken seriously until it can do X” where X is something like centimeter-accurate location and camera pose determination, continuous image recognition, 3D object tracking, or perhaps making a band of angels dance on the surface of a contact lens. I love that stuff too. Advancing the technology is great, and it does make for cool screenshots and demo reels. But I guess I have a different view of what’s most important. AR is a unique medium because it blends digital content with the physical world. It happens in the places where we experience our lives; in cities, villages, countryside and wilderness, with family and friends and strangers around. It happens in the now, day and night, spring and fall. It engages our senses and taps into our emotions, revealing the invisible stories of the world around us. AR is a medium of living human experience. In AR, we already have an incredible toolbox of capabilities to work with. Mobile is mainstream, we’re all connected, and data is gushing from every spigot. It’s truly an embarassment of riches. What the AR community needs most this year is to push the frontiers of creative expression; to engage all of our senses, to embrace narrative and culture and play, to use the world as both a platform and a stage. In 2011, we need to become the best possible storytellers and experience designers for this new physical, digital, experiential medium. If we can’t do this, none of our technology will matter, except maybe on YouTube. 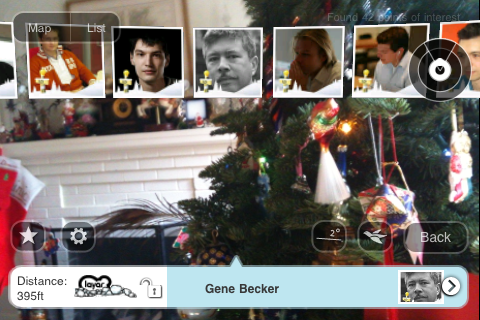 Our Layar augmented reality Christmas card is live at http://m.layar.com/open/xmaslayar on your mobile, where you can throw snowballs at your favorite Layar team member and leave your wishes for us! Have a great holiday! I have a bit of news: I’m joining Layar, the Dutch mobile AR company, as an Augmented Reality Strategist. \0/ In this new role I’ll be developing the creative ecosystem for the Layar platform, working with artists, developers, agencies, brands and media geeks to push the boundaries of AR experience design. As the first US-based team member, I’ll also be helping establish Layar’s Bay Area presence and growing the North American community of mobile AR enthusiasts. 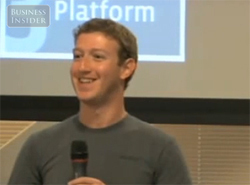 There’s more at the Layar blog. As for Lightning Laboratories, I’ll still be blogging here and sending out the occasional Connected World newsletter. However,Â the consulting part of the business will be offline for the foreseeable future. My social media practice will move over to TrendJammer, the new social consulting & analytics venture that my friend Risto Haukioja has launched, and for which I’m an advisor. If you’re interested in that sort of thing, there’s lots of fun going on at trendjammer.com and @trendjamr on Twitter. If you want to get in touch, the usual channels still apply: @genebecker, @ubistudio, gene at lightninglaboratories dot com, etc. For super-double-secret Layar business, I’m now gene at layar dot com. Now let’s get out there, people — we’ve got a new medium to build! 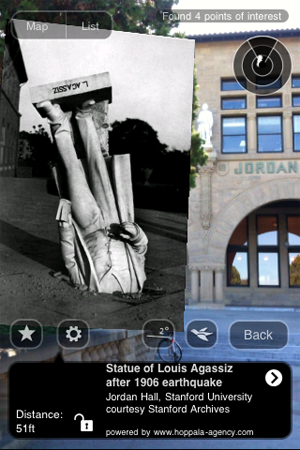 In collaboration with Adriano @Farano, I’ve been experimenting with creating historical experiences in augmented reality. Adriano’s on a Knight Fellowship at Stanford, and he’s seeking to push the boundaries of journalism using AR; my focus is developing new approaches to experience design for blended physical/digital storytelling, so our interests turn out to be nicely complementary. This is also perfectly aligned with the goals of @ubistudio, to explore ubiquitous media and the world-as-platform through hands-on learning and doing. Taken from the interior of the Quad looking toward the Oval and Palm Drive, you can see that the photo aligns reasonably well with the real scene. Notably, the 1905 picture reveals a large arch in the background, which no longer stands today. We later found out this was Memorial Arch, which was severely damaged in the great 1906 earthquake and subsequently demolished. 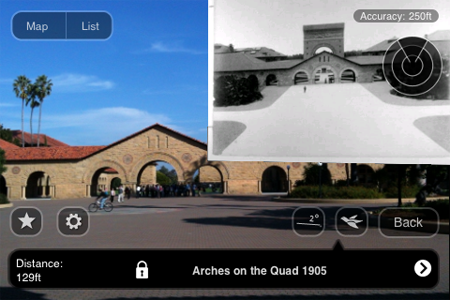 In our second playtesting session, we continued to experiment with historical images of the Quad using Layar, Hoppala and my iPhone 3Gs as our testbed. Photos were courtesy of the Stanford Archives. This view is from the front entrance to the Quad near the Oval, looking back toward the Quad. Here you can see the aforementioned Memorial Arch in 1906, now showing heavy damage from the earthquake. The short square structure on the right in the present day view is actually the right base of the arch, now capped with Stanford’s signature red tile roof. 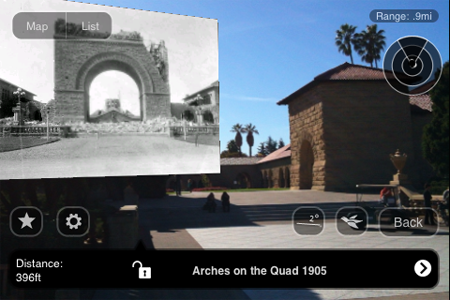 In this screencap, Arches on the Quad 1905 is showing as the currently selected POI, even though the photo is part of a different POI. Although the image is scaled a bit too large to see the background well, you can make out that we are in front of Jordan Hall; the white statue mounted above the archway on the left is in fact the same one that is shown in the 1906 photo, nearly undamaged andÂ restored to its original perch. 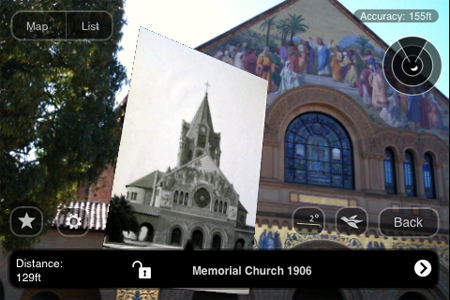 Finally we have this pairing of Memorial Church in 2010 with its 1906 image. In the photo, you can see the huge bell tower that once crowned Mem Chu; this was also later destroyed in the earthquake. November 3rd, 2010 | Gene | Comments Off on je mixe ce soir! I paraphrase, obviously. But seriously, did you read Ray Ozzie’s Dawn of a New Day? It’s his manifesto for the post-PC era, andÂ a poignant farewell letter to Microsoft executives as he unwinds himself from the company. In Ozzie’s post, frequent readers of this space will recognize what I’ve been calling ‘the new revolution in personal computing’, the rise of a connected world of mobile, embedded and ubiquitous devices, services, sensors & actuators, and contextual transmedia; a physical, social, immersive Internet of People, Places & Things. Frankly, there’s nothing especially surprising about this vision of the future; many of us (including Gates and Ozzie) have been working toward similar ideas for at least 20 years. Former HP Labs head Joel Birnbaum was predicting a world of appliance/utility computing (pdf) in the ’90s. I’m sure that many of these ideas are actively being researched in Microsoft’s own labs. 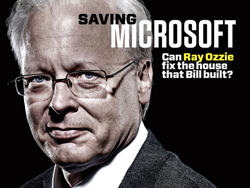 What I find really interesting is that Ozzie is speaking to (and for) Microsoft, one of the largest companies in tech and also the one company that stands to be most transformed and disrupted by the future he describes. He’s giving them a wake-up call, and letting them know that no matter how disruptive the last 5 years may have seemed to the core Windows and Office franchises, despite the wrenching transition to a web-centric world, the future is here and you ain’t seen nothing yet. And now at “the dawn of a new day â€“ the sun having now arisen on a world of continuous services andÂ connected devices”, Ray Ozzie is riding off into the sunset. I don’t see how that can be interpreted as a good sign.